"In the hours following the April 16 tragedy, the student-driven volunteer organization Hokies United placed 32 Hokie Stones on the Drillfield. The semi-circle of stones became a place to gather, to mourn, and to reflect, and the poignant display inspired today&#39;s memorial. 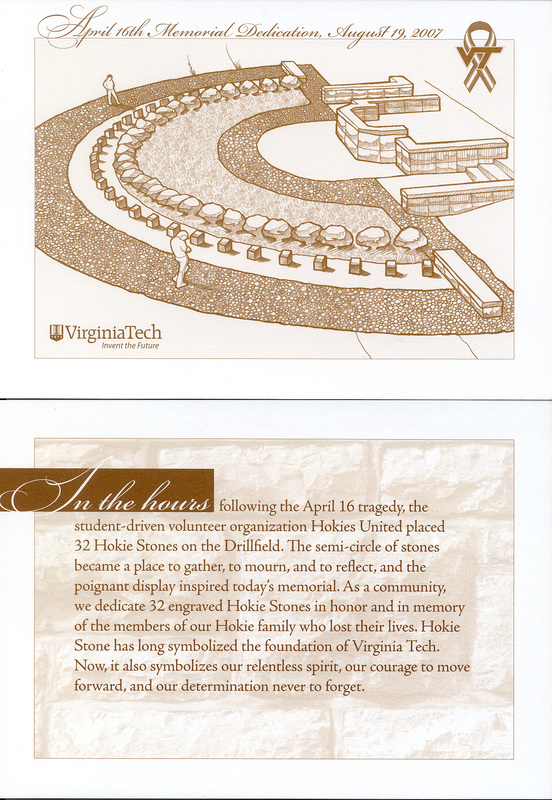 As a community, we dedicate 32 engraved Hokie Stones in honor and in memory of the members of our Hokie family who lost their lives. Hokie Stone has long symbolized the foundation of Virginia Tech. Now, it also symbolizes our relentless spirit, our courage to move forward, and our determination never to forget." 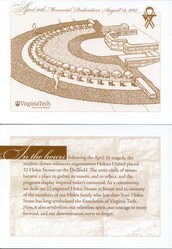 Brent Jesiek, “Program from April 16th Memorial Dedication, August 19, 2007,” The April 16 Archive, accessed April 24, 2019, http://april16archive.org/items/show/1209.